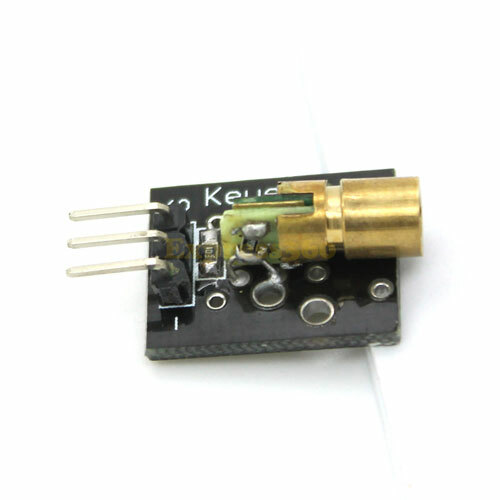 Photo Interrupter Module Keyes KY-010 for Arduino, will trigger a signal when light between the sensor's gap is blocked. THe KY-010 Photo Interrupter module consists of an optical emitter/detector in the front and two resistors (1 kΩ and 33 Ω) in the back. The sensor uses a beam of light between de emitter an detector to check if the path between both is being blocked by an opaque object. Connect the power line (middle) and ground (left) to +5V and GND respectively. Connect signal (S) to pin 3 on the Arduino. The following sketch will light up the LED (pin 13) on the Arduino when there's an object blocking the beam of light between the sensor's gap. 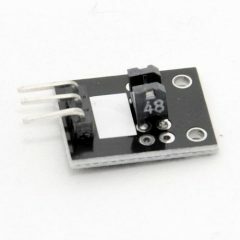 Frizting Part: KY-010 Photo Interrupter Module. HI, what’s the wave lengh of the Diode please ?